STAMFORD, CT – April 30, 2018 – As the Stamford Public Education Foundation (SPEF)’s Service-Learning mentoring sessions came to an end for the year, approximately 110 fourth grade students from Davenport Ridge Elementary School gathered for a culminating community-service project on Monday, April 23rd. Their mentors, from J.M. Wright Technical High School, constructed a tool shed for Davenport Ridge’s outdoor classroom. Then, on Monday, mentors and mentees decorated the tool shed with creative fingerprint art. This was a culminating project for SPEF’s Service-Learning program, which is an acclaimed education strategy that integrates meaningful community service with instruction and reflection to enrich the classroom experience, teach civic responsibility, and strengthen communities. 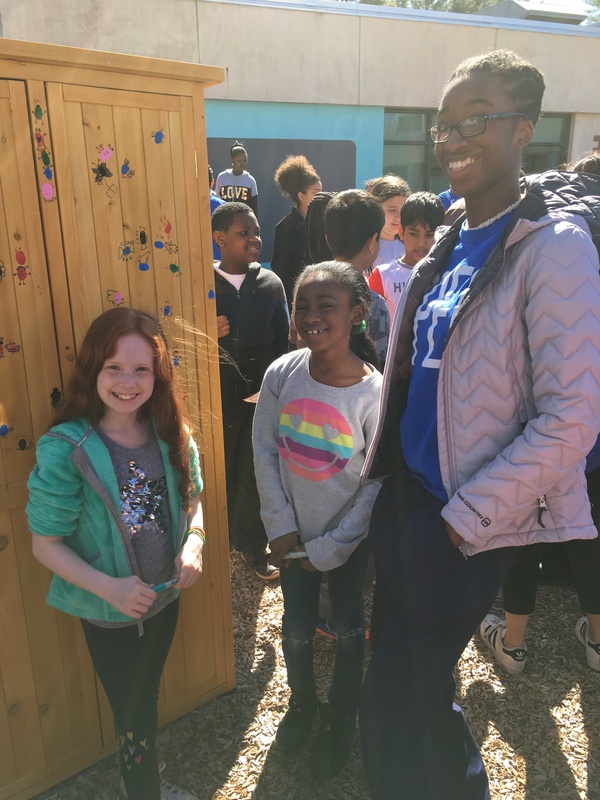 During weekly mentoring sessions, mentors and mentees discuss topics related to Service-Learning and the program concludes with community service projects such as stocking shelves at the Food Bank or cleaning up school playgrounds and parks. This program is part of SPEF’s nationally-recognized Stamford Mentoring Program, which served over 900 students in grades 3 – 12 this school year.